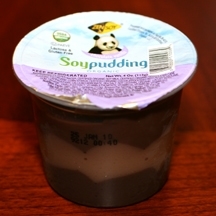 ZenSoy Organic Soy Pudding is made from U.S. grown soybeans. It is 100% natural, certified organic, certified vegan, certified Kosher, and does not use genetically modified soy beans. In summary – it’s healthy. I did a side-by-side comparison with another brand’s Chocolate Vanilla pudding and found that the ZenSoy soy pudding had less fat (both total and saturated), less sodium, and more protein. It had slightly more total carbs (from 1g extra sugar) but the ZenSoy soy pudding also has lots of extra vitamins, including vitamins A, D, B12, and B2. 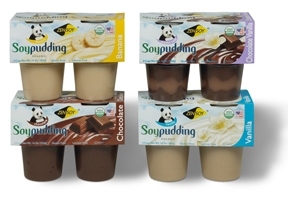 ZenSoy soy pudding has four varieties of pudding available – Chocolate, Vanilla, Banana, and Chocolate Vanilla Swirl. 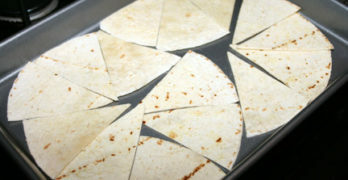 We know that soy can be healthy, but sometimes our stomachs just want some flavor! Well, ZenSoy soy pudding has that too. It’s important to mention that the three testers who sampled this pudding are not what many people would call healthy eaters. Personally, the only time I’d eaten soy anything was if it was a bean in a Chinese food dish. I think this matters because it puts into perspective that our palette’s are used to, and almost expect, lots of sugar and sweetness in pudding. So with spoons in hand, the three of us bravely opened our sample Chcolate Vanilla Swirl ZenSoy soy puddings and dove right in. 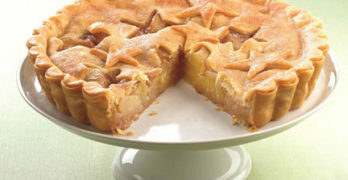 Every bit of hesitation or skepticism went right out the door with the very first bite. Eyebrows were raised and spoons were licked clean. To me, the chocolate pudding was the best part. It smelled like freshly made brownie mix and tasted like a rich chocolate cake. My fellow testers agreed that the rich chocolate flavor was nicer than typical puddings. One even said, “It reproduces the flavor of unhealthy pudding very well.” Haha! We all enjoyed the mix between the chocolate and vanilla flavors. In a blind taste test, this one would probably win for me, simply because the flavors seemed so much more natural, without any artificial-ness, which really allows them to shine. The texture of the pudding was what a pudding should be and was very smooth; it wasn’t too thick or too runny. If you’re looking for a healthy, gluten-free, lactose-free, vegan, Kosher alternative to snack on, definitely check out ZenSoy pudding. I recommend the chocolate flavor simply because that was my favorite part of the Chocolate/Vanilla Swirl. 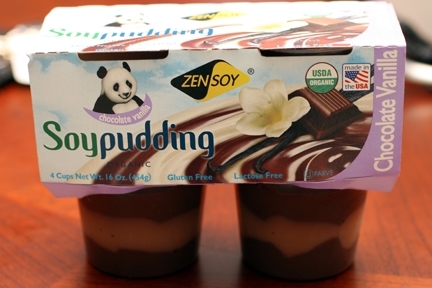 ZenSoy soy pudding is available now in stores nationwide. I got mine at Whole Foods where it was priced at $2.99. One nice perk to buying ZenSoy products it that ZenSoy donates 5% of their profits to international wildlife organizations to help preserve the environment and save the pandas. ZenSoy has generously given us a prize for the WCatDD ZenSoy Pudding Giveaway! 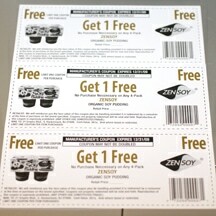 One winner will receive THREE coupons for a free 4-pack of ZenSoy Organic Soy Pudding. THIS ENTRY IS REQUIRED FOR ALL OTHER ENTRIES TO BE VALID (+1): Visit zensoy.com and tell me one other product you’d like to try or one thing you learned about the company. Giveaway ends at 11:59 PM EST, December 10, 2009. Disclaimer: This post consists of my (and/or fellow tester) opinions only. No compensation was given for this review/giveaway. I did receive a coupon for one free ZenSoy Pudding from the company or their PR agency to use and test for the purposes of this review. This did not affect the outcome of this review.